Social media is the easiest and cheapest way to market your business. Many new business owners are taking advantage of the massive amounts of traffic these platforms see each day by advertising their service or product. 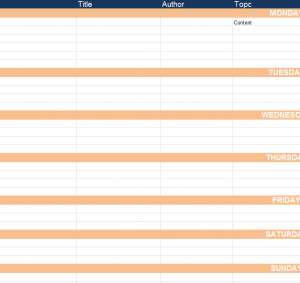 The Media Management Calendar is designed for you to easily assign yourself media posts throughout the week and have a complete marketing action plan for the next 7 days; it’s as easy as filling out the topic and date. Start your social media empire today! The first thing you’ll need to do is download the free file located at the bottom of this page, simply click the link provided. Each day of the week is listed and centered for you to easily recognize. Just go through the week and fill out the information listed in each category at the top of the page. You’ll start by entering the “URL” of your social media site, the title of your post, the topic, the due date, time of day, any image associated with your post, and finally the platform you plan on using, such as Facebook, Twitter, etc. When you have everything you want entered into the template you can easily print the document by selecting the “File” button in the top left corner of your screen and selecting the “Print” option from the drop-down menu that appears. You want to make sure that you have your posts planned out well in advance. By having your posts readily available you’ll save time for more important aspects of your business. Nothing is better than a free marketing strategy, but you have to be willing to work to make it effective. The Management Calendar just helps you organize your posts and speeds up the process. Get the most out of your time with this template!